Although no trace of infant formula from China has turned up in this country, U.S. authorities said Friday they are taking added precautions to keep out tainted milk products. The Food and Drug Administration has widened its inspections at ports of entry to focus on shipments of bulk food ingredients from Asia that are derived from milk, such as milk concentrate and whole milk powder. Spokeswoman Judy Leon also said the agency will issue an alert this weekend warning consumers not to buy milk products from China on the Internet. China's food safety crisis widened after the industrial chemical melamine was found in milk produced by three of the country's leading dairy companies - prompting stores, including Starbucks, to yank milk from their shelves. The recalls come as evidence is mounting that adding chemicals to watered-down milk was a widespread practice in China's dairy industry. The chief financial officer of one of the companies, Mengniu, apologized Friday for the tainted milk. But he insisted only a small portion of the company's inventory had been contaminated and said the tainted milk came from small-scale dairy farmers. "Large-scale milk farms are very disciplined. They won't take the risk to do something like that," Yao Tongshan told reporters in Hong Kong. The crisis was initially thought to have been confined to tainted milk powder, used to make baby formula that has been blamed in the deaths of four infants and for sickening 6,200 other children. But tests found melamine in samples of liquid milk taken from China's two largest dairy producers, Mengniu Dairy Group Co. and Yili Industrial Group Co., as well as Shanghai-based Bright Dairy. The chemical, which is used in plastics and fertilizers, can cause kidney stones and lead to kidney failure. Melamine is the same chemical involved in last year's massive pet food recall. In that case, it had been added to bulk pet food ingredients imported from China. But an ongoing national investigation focusing on Asian community markets has turned up no infant formula from China here. "In conjunction with state and local authorities, we have inspected more than 1,000 retail outlets and have found not one single can of Chinese infant formula," said Leon. Nonetheless, the agency plans to issue an advisory Saturday warning consumers not to buy milk products from China on the Internet. "We know it's possible to purchase Chinese products on the Internet, and we want to make sure people do not purchase infant formula or any product containing milk or milk derivatives," said Leon. 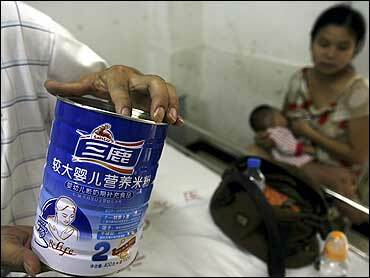 Infant formula is closely regulated here, and no Chinese companies have approval to export to the United States. China is an importer of milk, and so it's also unlikely that any milk products from China would turn up in this country. Nonetheless, Leon said the FDA is sampling bulk shipments of milk-derived products from Asia for possible contamination with melamine or other banned ingredients. The products being tested include whole milk powder, whey powder, milk concentrate, lactose, casein protein, and other milk derivatives.